The Thompson Frozen Block Flaker is a heavy duty industrial machine specifically designed to process large volumes of frozen product. It is used extensively in many high production facilities worldwide. It is renowned for consistently delivering high performance and reliability. The Thompson Frozen Block Flaker is a robust machine that is built to last. Constructed from high quality Stainless Steel, a strong framework supports a heavy gauge feed chute and table. The Thompson Frozen Block Flaker has been designed and developed to the high standards of safety and finish demanded by CE/USDA and GS regulations. The Thompson Frozen Block Flaker is the perfect companion for the Thompson range of Mixer Mincers. This machine can rapidly transform frozen blocks of meat or other suitable products such as frozen cheese, into flaked product. Eight curved blades rapidly cut scalloped pieces from the frozen block and eject them into a 200 litre bin. Due to a unique guarding system which closes the discharge chute, blocks can be queued and then processed without stopping while bins are being replaced. 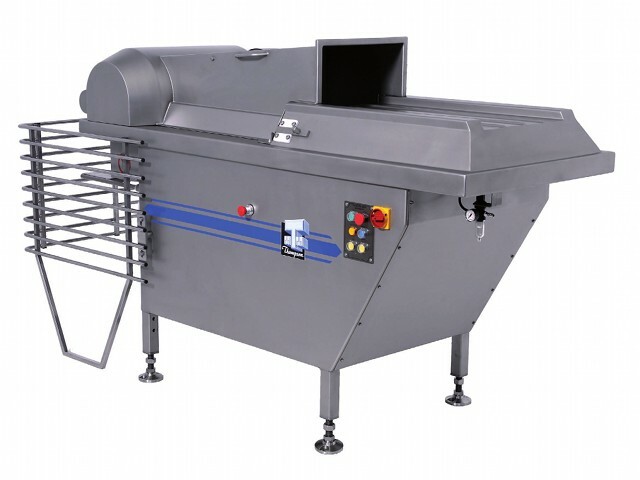 The feed chute is electronically locked during the cutting cycle and can only be opened after the motor has been stopped and a time of 40 seconds has elapsed; this time allows the heavy Stainless Steel Drum to come to a complete stop. For safety, the machine cannot be Flaker Drum Assembly restarted until the feed chute has been closed and locked. Two lights on the control panel indicate the machine’s state, i.e. amber for locked and ready to process product or blue for open in preparation for cleaning. With the aid of a pneumatic button the ram can also be stopped midway in its stroke to allow the operator to remove any product trapped behind the push bar. With the feed chute opened there is safe and easy access to the working parts of the machine for cleaning and sanitation. This machine is of robust construction and the drum has been designed to achieve a satisfactory level of dynamic balance.